Like most sports, diving has its' own lingo. Here's a scuba diving glossary so you know what people are talking about on your next dive trip. 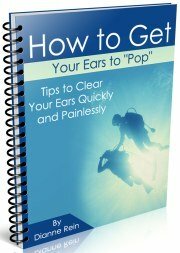 Please let us know if you would like anything added to this scuba diving glossary. Backroll - A way to enter the water. You sit on the side of the boat, put your hands over your mask and regulator, and fall back into the water, tank first. When you first do it, you think you will hit the boat. You won't. The Bends - the pain a diver feels when nitrogen bubbles form in their joints. This happens when you rise to the surface too quickly. Never had it. Don't want it. Neither do you. So be careful on those ascents! BC - buoyancy compensator. 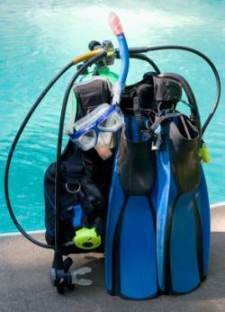 Read our guide to scuba bcd's here. More scuba diving glossary below. Bootie - Looks like a sock and is made out of neoprene. Usually has a built in sole. It is worn under open heel fins to keep your feet warm and prevent scraping. Also good for beach shoes and walking on a wet dive boat. Read our guide to scuba booties here. Bottom time - the length of your dive. Normally includes all time spent underwater, including your safety stop. Let's hope it's not infinite! C-Card - certification card. This is the card you receive after you finish and pass your certification course. It allows you to dive with dive operators the world over. Alot of bang in a credit sized card! Check-out dive - For those that aren't lucky enough to be diving on a consistent basis, some resorts require a check out dive before you can hit the water. The divemaster checks out your skills and makes sure you know what you are doing. Also gives you a chance to become reacquainted with your equipment. Decompression sickness/decompression illness (DCS or DCI) - When bubbles of gas (usually nitrogen) are trapped in the tissues of the body. This could happen after a reduction in pressure and is caused by a diver coming to the surface too quickly. It has a variety of symptoms. In the worst case, it could lead to death if not properly treated. 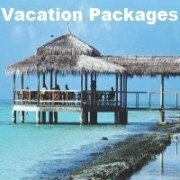 Dedicated dive resort - A resort which is centered around diving. Usually includes several dives a day or unlimited diving. Dive buddy - your underwater partner. On a dive boat, you always have to have a person to team up with. You are responsible for each other underwater. You should stay close to each other to help each other out in case something goes wrong. If you are on the boat alone, the divemaster will team you up with another person on the boat. Could turn into your drinking buddy too! Drift diving - Alot of fun! You go out on the boat and jump in the water. The captain remains on the boat and follows the divers as they move along with the current. He follows either by looking at the bubbles or a dive float that one of the divers is dragging along. After you surface when the dive is done, the boat is there to pick you up (hopefully). This is opposed to going to a dive spot and anchoring or tying to a mooring. Then you get off and on the boat in the same spot. 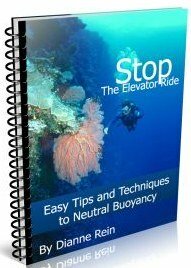 Read about drift diving here. Hand signals - A simple underwater sign language. 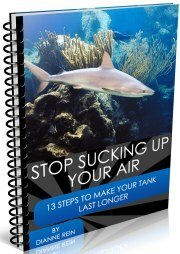 All divers know the basics - going up, going down, OK, out of air, shark. 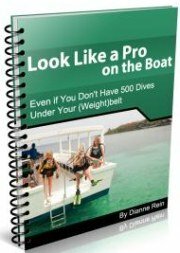 Most common is the OK to let divemasters know your are alright. 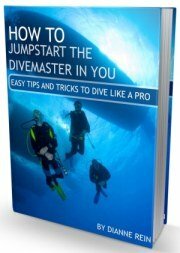 Divemasters usually give a quick review of common signals to use on the dive. Feel free to make up your own with your dive buddy. And the middle finger is an option. Hooka (hookah) rig - A surface supplied air system which allows you to dive without tanks. You are connected to a rig on the surface by a long hose (typically 40 feet) with a regulator. The rig consists of a motorized air compressor normally attached to a floating tube. It pumps a steady stream of air down to the dive. One system can usually supply 4 divers. Mooring Buoy - A permanent marker for tying off the dive boat. Helps prevent damage to the local coral from anchoring. Usually found in more established dive areas to mark popular dive sites. Narc'd - nitrogen narcosis. A light headed or inebriated condition (not caused by drinking!). Can occur on dives over 100 feet. Corrected by going shallower. Can cause stupid decisions (and possibly death) if ignored. A good reason to keep close watch on your dive buddy. Night diving - Just what it sounds like, although it is often done at dusk. You use an underwater flashlight and see a whole new group of sea creatures being active in the nocturnal environment. A little scary at first but you soon get used to it. Read our tips for night scuba diving here. Nitrox (aka "Geeser Gas") - An oxygen enriched gas used instead of the more typical compressed air. It allows you to extend your bottom time and is believed to help prevent "the bends." Certification agencies recommend a separate nitrox course before diving with this gas. Open water certification - Basically your scuba diving training course. After you complete it, you receive your c-card and are good to go diving. Open water refers to the 4 or 5 dives you do to complete your course - usually in a lake, quarry or ocean. Your training is in a closed environment, otherwise known as a pool. Rinse tank - a tank of freshwater where you rinse off all your gear after a dive. Safety stop - Period to allow you to off gas. After a dive, you ascend to 15 feet. You then stay at 15 feet for a period of 3 -5 minutes to allow excess nitrogen to leave your bloodstream. Helps prevent the bends. Most divemasters require this. Even if they don't you should do one. Sand shoot - A sloping hill of sand between two coral heads. Surface interval - Time between dives. Allows you to offgas, or get the nitrogen out of your system. 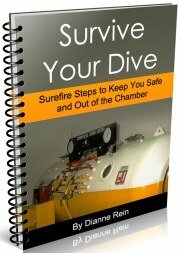 You typically do a 2 tank dive when diving with dive shops. You do one dive and then surface. You then spend about 45-60 minutes either on the boat or onshore (depending on the location of the dive site and the whims of the divemaster) before you do your second dive. Swim thru - Usually a short underwater tunnel. Light can usually be seen from both ends. NOT a cave dive. 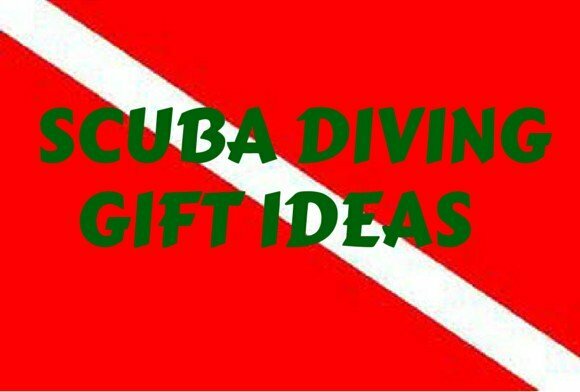 Adds a bit of excitement to your dive. Tank banger - An underwater signaling device. Similar to a bungee cord with a hard plastic ball attached. Fits around the bottom of your tank. To get a divers attention, you reach back, pull on the ball and let it go so it gives a nice ping off the metal tank. If your dive buddy isn't paying attention to you, just ping and give that &*%^* look! 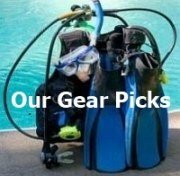 Read our guide to scuba diving accessories here. Time to fly - Amount of time divers must wait after their last dive to fly safely. It generally recommended that you wait 24 hours after your last dive before flying to reduce the chance of decompression sickness. Vis - divers lingo for visibility. How far you can see underwater. Wetsuit - Read our guide to scuba diving wetsuits here. There you have it. A scuba diving glossary for you to refer to. We hope this scuba diving glossary comes in handy. If you would like to see anything added to the scuba diving glossary, please let us know.